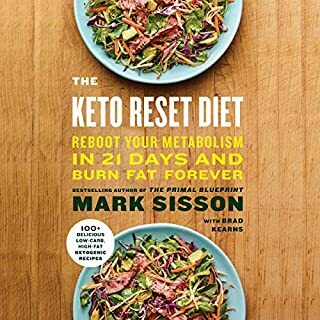 He offers an in-depth look at how we can take control of our "smart genes" through specific dietary choices and lifestyle habits, demonstrating how to remedy our most feared maladies without drugs. With a revolutionary 30-day plan, Grain Brain teaches us how we can reprogram our genetic destiny for the better. 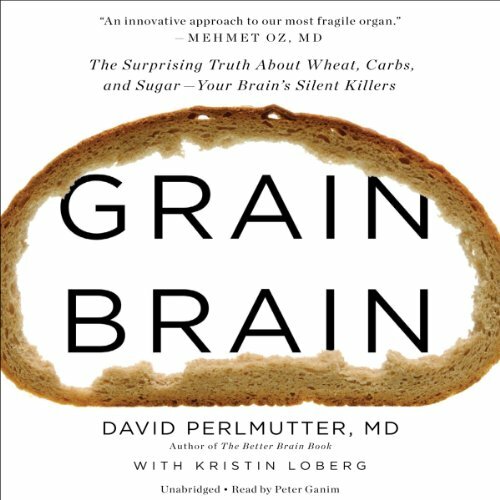 Would you consider the audio edition of Grain Brain to be better than the print version? There's a lot of great information in there, I'm just struggling to get past the fact that the reader sounds like a cross between a robot and a 1960s tv commercial. So hard to listen to. What was most disappointing about David Perlmutter and Kristin Loberg ’s story? The narrator. The contents are awesome. I'm hoping I can make it to the end of the book, but every time I get in the car to listen I just can't... might have to buy the hard copy. Who might you have cast as narrator instead of Peter Ganim? Dr Pearlmutter himself. It's a personal book where he talks about 'My son" "My work" etc. I've listened to him speak on podcasts, he's amazingly inspiring. Shame he couldn't take the time to record this himself. 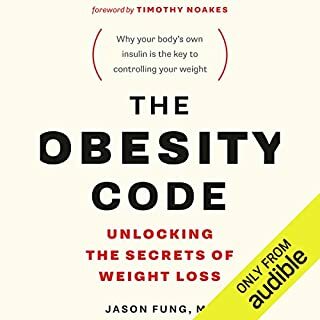 This was my third book I have listen to on the science of how carbs and fats affect on your body differently. 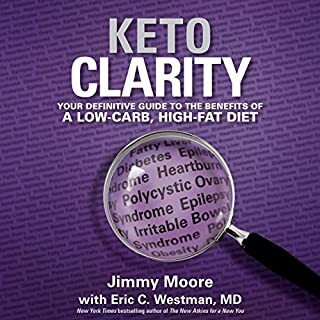 I have listen to Wheat Belly and Keto Clarity, they both had much information and were entertaining in their own right. I felt that Grain Brain offer much more information on how you can improve the body and more facts from research on the brain and yet I found it easier to listen to. Wheat Belly was better for the information on the harm of Wheat and it's history in civilization but lack other information on food and excise that this book brings which can improve your health. 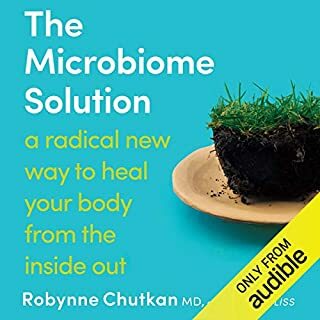 I love most the learning the how the type of food affect the gut and how from the gut it comes to affect the brain and the body. It warns the reader that their lifestyle choices could be increasing their risk of a shorter life with more pain and suffering. The author has lot to say about the medical industry (and even a little bit on education system) and how many in the profession try to treat problems with drugs and surgery without first trying to understand the cause. As they say prevention is better then cure. 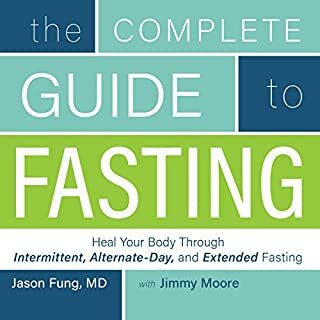 If you can get anything out of this book it should help give you the knowledge for you to lower your health risk, get tested for gluten sensitivity, cut down on carbs and sugars and how to improve your eating habits. Some good information, particularly towards the beginning of the book. However, the author relied heavily on anecdotes and personal experience with clients for many of his assertions. One need only look at the evidence (e.g., a high quality meta analysis of the available literature from Cochrane) to determine that his claims of, for example, gluten-free diets curing or significantly improving symptoms of Autism and ADHD, are not supported by the preponderance of evidence to date. Read carefully and with a critical eye - extraordinary claims require extraordinary evidence. If you could sum up Grain Brain in three words, what would they be? What other book might you compare Grain Brain to, and why? How the Western diet is killing you. Must read. Do your research. There's so many studies backing up this science and it's a great culmination and explanation of them. not enjoyable for a me at all. I couldn’t bring myself to listen to this book. The content itself is interesting but the experience is ruined by a narrator who sounds like a monotonous robot. UNBEARABLE!!! very interesting look into the effects of gluten on the body and brain. food for thought! 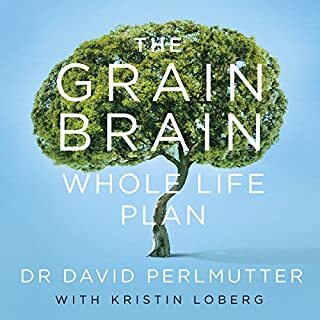 thanks Dr Perlmutter for putting this all together, I've listened to it twice in a month and there was so much information I needed to hear it again. This has changed my life and the life of my family. So interesting! Everyone MUST read this! It's so important! Why doesn't everyone know this information! Seriously, what an eye opening book. Whilst reading I spent an inordinate amount of time shaking my head in disbelief, my mouth open and feeling the breeze around my molars. The information is disturbing, well written and is easy to read and understand. It has certainly changed the way we eat in our home. If you are interested in health and how the body operates this is an essential read. it makes you question our Western diet and deep down it resonates. This book shares much information with "Wheat Belly" by Wm. 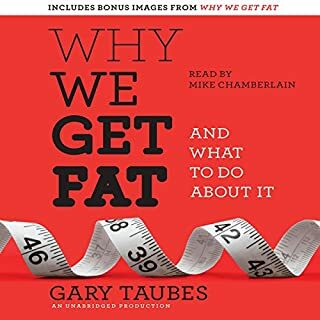 Davis and "What Makes us Fat" and "Good Calories, Bad Calories" by Gary Taub, but Dr. Perlmutter focuses more on the effects of a high carb, low fat diet on the brain. Conditions like diabetes are discussed thoroughly but in the context of explaining how these diseases impact the brain. This book was timely for me. I adopted a wheat free/ low carb eating plan in April of 2012 after reading "Wheat Belly" and my "set point" weight dropped by 16 lbs in just a few weeks. This was despite the fact that I already had what most would consider a healthy diet. But, because I cook for family members who have not adopted these eating habits, I became lazy about preparing separate foods and saw my weight creep up a few pounds and some of the other health improvements falter in the last few weeks. 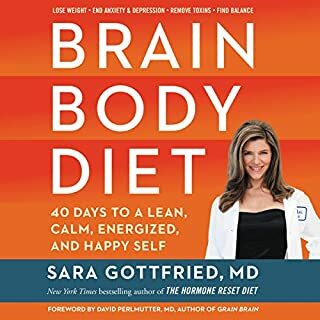 This book was an excellent refresher course for grain free and low carb eating as well as a jarring wakeup call about the ways eating habits change our brains. Alzheimer's has a frighteningly high frequency among women in my family, so I am encouraged to learn that I have at least some control about the future health of my brain. Dr. Perlmutter's advice differs in a few ways from Dr. Davis. Dr. Perlmutter recommends fasting and recognizes a correlation between low calorie consumption with greater brain health. This book also says it's okay to cheat now and then. Most of the other books caution readers against cheating, likening carb consumption to dependence on addictive drugs. This is the case I have found to be true. Cold turkey for "carbaholics" is easer than relying on will power and moderation. 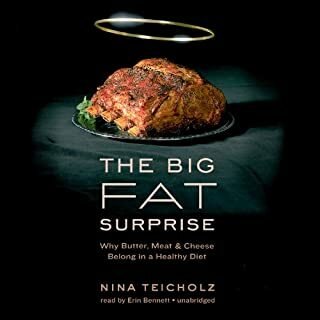 I like that this audio book is accompanied by a PDF featuring some the statistics, recipes, etc. 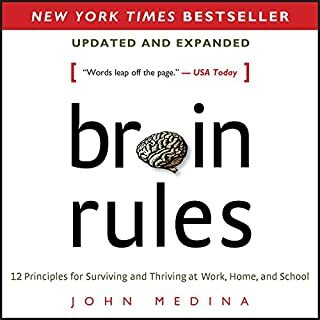 If you have read other books on this topic, I recommend reading this book as well because it focuses heavily on the neurological impact of gluten and carbs. 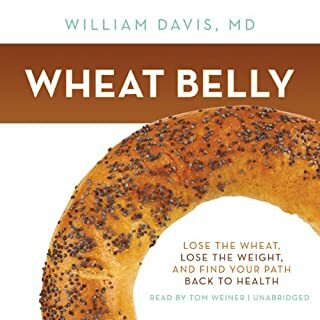 On the other hand, if you have not read "Wheat Belly" and "What Makes us Fat", I recommend these in addition to "Grain Brain" as these books go into more detail about the evolution of the grains we eat today and the illogical processes that resulted in much of the dangerous "conventional wisdom" that many health professionals view as holy writ today. Narrator does a nice job. Please ignore those who have not read the book! This is an important work. Please ignore those who say "skeptical" without reading it. For example one reviewer claims he is confused as to why Dairy is not recommended. Well, it is. 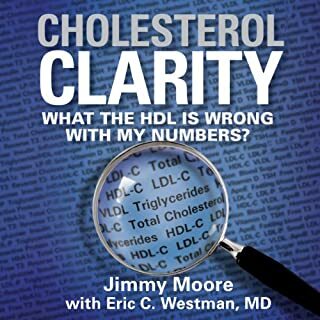 He also cites a book about cholesterol being healthy, which is a fact the book concurs with. I would not be surprised if that review was someone just working for the competing "diet book." As someone who read the book and followed the food recommendations I can attest they are life altering. I am below my high school weight and my mind is sharper than it has been in years. 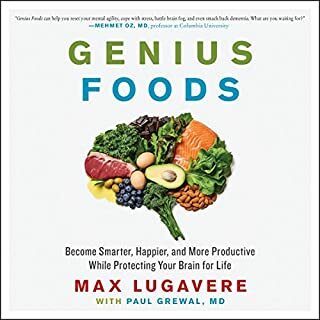 The book explains, with medical research to back it, why common foods are harmful not only for your body generally but to your brain specifically. The sad truth is there are monied interests wanting us to keep eating grains, carbs and "low fat" processed goods and that is the only reason these harmful foods are even around. Can't live without "carbs," Wrong. I can barely live with the fact I have been eating carbs all this time. 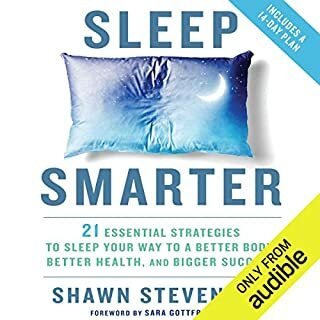 If you are scanning reviews, please read this book and listen to the science. You will be convinced and if you follow the food ideas you will be transformed. The more people that do the sooner the carb industry can become extinct. Do you love your Brain or your Bread? My Mother and her sisters all had Alzheimer's. We thought it was just "those crazy Italians". It was that side of the family that loved the pastas, breads, and pastry. There is also a great deal of depression "on that side of the family". Now I see why. This book has changed my kitchen, my breakfast, lunch and dinner plates. I have dropped 12 pounds so far and feel so much better. Depression and Alzheimer's takes your loved ones away bit by bit, and day by day, there is no cure AFTER you get it, but it is PREVENTABLE. 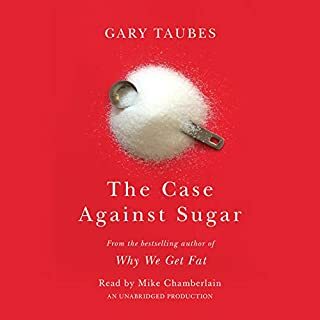 Thank you Dr. Perlmutter for giving us hope and tools to avoid these slow and pervasive thieves called sugar and carbohydrates. This book is the perfect companion to Dr Perlmutter's book Brain Maker, one of my favorite recent health titles. Grain Brain carefully and clearly presents the reasons why everyone needs to make drastic and life altering changes to the way we view food and illness. The cause and effect link that Dr Perlmutter proposes undoes long held beliefs in the health care world about the relationship between diet and disease. Important life altering information is presented which will propel most readers into permanent dietary change. If you are looking for a way to change the way you eat and feel Grain Brain is the perfect place to start. Excellent and fantastic information. I completely believe that “you are what you eat” but there are SO MANY different theories out there about doing it “the right way” that who do you ultimately believe? This doctor says A, another doctor swears by B, and yet another says C is the key to health and long life… so who’s the liar? (and are they all doctors?) Do you just go with whoever sounds the most credible and who presented their hypothesis in the most factual way? and if so, did you fact-check their research? How can you REALLY be sure it’s all correct? And of course… who funded them? Am I really getting both sides of the argument? Regarding this book in particular, I can’t help but feel that he is selling fear and the miracle pill to solve everything. “Even if you have no symptoms, you can be at high risk… unless you do as I say” “Do you suffer from any of these symptoms? ____________ (insert endless list of ailments), well read on because I have the cure!” – there is an element of false hope in there somewhere. I’m not saying he is lying, or wrong, or anything like that – it’s just that the tone of his book seems a little foreboding and ominous. Perhaps he is just trying to express how serious the issue is, but to me it just left me feeling doomed. Personally, I really believe that no one method will have the same impact or work in the same way in different people’s bodies. I think the answer is somewhere in the middle where the zillions of nutrition theories intersect; I don’t think there is such a thing as a “universal answer” aside from: put the fork down and go for a walk! In conclusion I would say it’s an informative book, it’s all very interesting … but pass the salt. What would have made Grain Brain better? There were a few good pages. For example, the specific blood tests that a patient could request from their doctor. There wasn't much science to the book. I wanted to know the ailment, what tests were selected and why, the doctor's interpretation of the test, what steps were followed, how the success was measured. Instead I heard a lot of grain bashing and rehashing. What could David Perlmutter and Kristin Loberg have done to make this a more enjoyable book for you? I would have enjoyed a better narrative and less wordy drama. How is it possible for two to write so many books about the ills of grains? Have you listened to any of Peter Ganim’s other performances before? How does this one compare? I like Peter Ganim's fiction work. He is very professional. The title is catchy. Grain Brain. I like that. The narrative was too emotional, and a bit didactic. Early on, there was a sentence that really annoyed me. "You've got to be living under a rock if you didn't know that . . ." I stuck it out for a couple of hours but eventually I just couldn't stand listening to it anymore. I am impressed that Dr Perlmutter is a medical doctor who appreciates and is erudite in matters of nutrition. He is a member of several nutrition associations. His book is very pithy and offers actionable protocols. The main thrust is about blood sugar levels as a result of eating gluten, sugars and carbs. I am interested in health and nutrition, tolerate gluten fine and am able to eat whatever I want and stay thin. 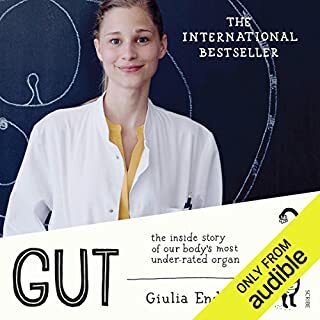 However, after reading this book and out of respect for Dr Perlmutter's body of work and experiences that he relates, I have decided to have as little gluten in my diet as possible. I don't eat much sugar or carbs to begin with however, I am not buying gluten free bread, crackers etc. It has been an easy transition. I've also cut back on fruit and fruit juice dramatically, preferring vegetables. I try to have about 1 serving of fruit each day. I am also adjusting my supplements according to his recommendations. I am going to add turmeric and resveratrol. Dr Perlmutter explains why statins are not good for you, the link between gluten and some brain diseases and why patients on a low-fat diet are at especially high risk. I found this to be a very interesting and compelling read. I found this book to be somewhat repetitive and therefore dull. interesting information if completely new to low carb diets, but nothing unique. could have pulled same info off the internet in a short session and saved a few hours of my life! Yes, because I am a nutritional therapy student and it illuminates the impact of inflammation (caused by gluten and certain carbohydrates) upon the brain, as well as the body. However, it does repeat some of the softer information too much - I would have preferred this in the areas relating to more complex scientific information so that I could come away from the listening experience with more than a basic outline of the content, and instead, with more substantial scientific connections which I could explain to others. Instead, I will need to buy the book itself and re-read it so I can focus on and absorb that information more. 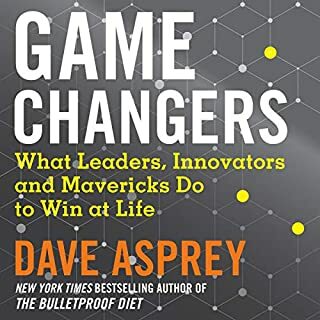 If you’ve listened to books by David Perlmutter and Kristin Loberg before, how does this one compare? I haven't listened to others before. Which character – as performed by Peter Ganim – was your favourite? There was only one character, but the narrator was excellent - he managed to keep full, clear energy even in the most dry of topics. Was Grain Brain worth the listening time? Yes, it was. But I do feel I need to buy the book as well now. I think this is perhaps better in a paper book rather than audible, given the content and that the recipes etc will always be to hand in the book, whereas those sent in PDF form via audible cannot be downloaded and saved to the computer for future reference. The book however, the content of it, is most certainly worth listening to and I would recommend it to all carbohydrate and gluten lovers, and those who want to improve their health - it sounds generic, as everyone would like that, but I do believe the recommendations given in this book, would do just that. This book made so much sense, it was uncomplicated and easy to understand despite the medical/scientific elements. For anyone that wants to live a healthier, happier life, this book is a must. It's not a fad diet book, it's based on scientific research and an understanding of who we are and where we have come from, giving a comprehensive view on how we are designed to exist. I recommend this book to anyone and everyone that will listen. I already feel fantastic myself for adopting Dr Perlmutters recommendations for a healthier way of life. I am a Personal Trainer and will be recommending this to all my clients. authors ambition was admirable. difficult to create a one size fit all book, but he does a great job. 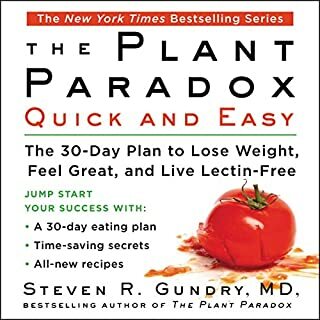 I got this book after the Whole 30. Just to keep me on track and help me kick the wheat habit. This book really helped reaffirm why I was doing it. I was shocked by the increased levels of gluten in our food, and by some of the well ingrained (no pun intended!) myths about eating fat and cholesterol. Yes, some of the technical names /terms are difficult to assimilated when you are just listening, but for people with busy lives, the audible version is a great way to digest the ideas. Both a fascinating & disturbing book! A must read! I love listening and re listening to this book. So good I even bought the hard copy!! Currently the NHS is still on the saturated fat bandwagon. I am sure it won't be long before it turns full- circle but that four or five years will be a long wait for doctors who do not necessarily think that we have the management of health issues correct when giving advice about diet . Everything points towards carbohydrates being the problem and our evolution has not been able to accommodate such intakes of carbohydrates no wonder we have a problem. Despite approaching this with an open mind, I'm not convinced by the extravagant claims made. I'd be interested to know the physiological costs of such a diet and why, if so effective, it's not adopted more widely in medical/health arenas. Yes, food affects brain function, mood, concentration etc but to these extents? Really? Please get to the point - I’m really interested - this book needs editing. I’m still fascinated to know..... also awful narration - weird burping hammy 1970s film trailer narrator - yawn. Never was a fabulous thesis so mangled.